Lots of goodies have arrived and more are on the way! 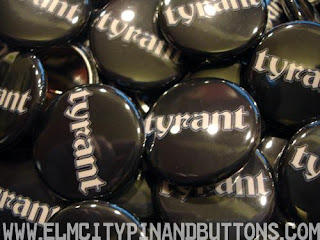 The TYRANT buttons are in and look great! A huge thanks to Kelly at Elm City Pins & Buttons for the hook up...in 2 days turnaround no less! The 2nd round of Limited Edition jackets and hoodies is due to arrive today and I'll be screening like mad early next week to have everything ready for the jam. I got some purple striped hoodies, they'll look great with painted on jeans and shoe lace belts! Bring that extra spending cash! Digger Davis at Pedal Power went above and beyond and got QBP BMX, a shop distributor, to hook us up with stuff for the jam! Thanks Steve! In addition, all the other sponsors confirmed they will have "Swag Bags" ready for pick up early next week. Woo hoo!